As a young boy growing up during the Cultural Revolution, Cai Guo-qiang witnessed the turbulence of the era play out within his own family. His father was Cai Ruiqin, an accomplished calligrapher and painter with a vast library of great Chinese literature. His mother was illiterate and evidently not very happily married. Yet, despite painful memories of the time, Cai designed the fireworks display that opened the Shanghai APEC summit meeting. 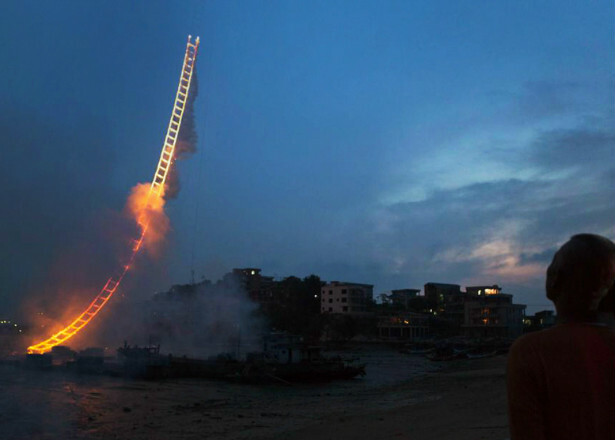 Kevin Macdonald surveys Cai’s life and career while documenting his most ambitious project yet in Sky Ladder: the Art of Cai Guo-Qiang, which screens during the 2016 Sundance Film Festival. Growing up in Quanzhou, a traditional center of Chinese fireworks production, had a formative effect on Cai’s art. 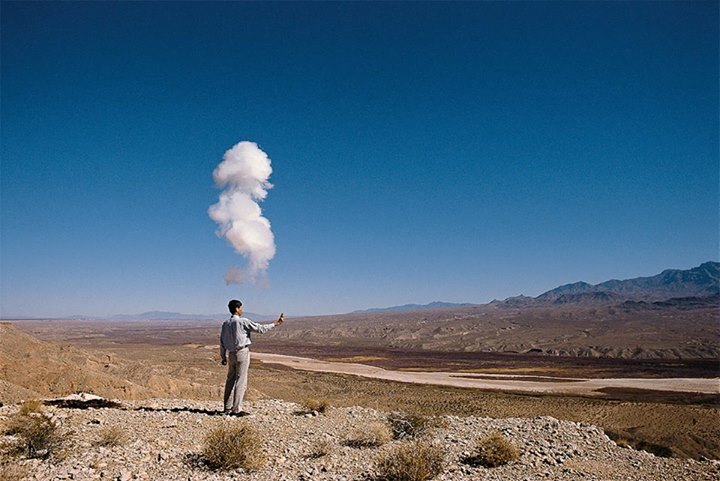 Although he also build fixed installation pieces, he is best known for literally painting the sky. For years, he has tried to realize his “Sky Ladder,” an illuminated Jacob’s Ladder reaching into the cosmos inspired by the Apollo 11 moon landing. However, circumstances beyond his control, like weather and 9/11, stymied his past attempts. In between those very expensive false starts, Cai accepted some very high profile commissions from the Chinese government. He and his associates readily defend his work for the Beijing Olympics, because his original artistic conception remained relatively intact. However, his former workshop director is openly troubled by his work on the lavish APEC gala, even though his original plans were almost entirely emasculated by the Communist government. Frankly, it is pretty impressive how much Macdonald pushes him on this issue. The truth is, that reality check needs to be there, since we have already seen Cai moved to tears when explaining his father’s suffering during the Cultural Revolution. As a result, Macdonald leaves viewers with no illusions regarding the current state of artistic and intellectual liberty in China. Still, Cai need not feel neglected, because Macdonald’s film vividly presents the artist’s often stunning work. This is one of the few documentaries that would have been suitable for IMAX treatment. His characteristically ambitious work (sans government interference) is more than mere fireworks, in some cases involving explosions of colored dust. You really need to see it to understand the full effect. Everything is complicated in today’s China, but the Cai that emerges through Macdonald’s lens really is an artist who creates art for art’s sake. In all likelihood, there will be little tangible payoff from realizing the Sky Ladder, yet watching Cai pursue it becomes surprisingly exhilarating. Altogether, Sky Ladder: the Art of Cai Guo-Qiang is an unusually complex and intelligent profiles of one of the most important contemporary artists of our time. Very highly recommended, it screens again this morning (1/22), Thursday (1/28), and Friday (1/29) in Park City, and tomorrow (1/23) in Salt Lake, as part of this year’s Sundance.